Avon Licorice* // Gosh Rainbow // Rococo Gold Leaf // Barry M Mustard* // OPI Meep Meep Meep // Barielle Elle's Spell // Look Beauty Pearl Effect. I can’t believe I’m already writing this post and just the other day I was going through my nail polish collection to pick out my favourite winter nail polishes. It feels like just the other day I was doing the exact same thing for my Autumn picks and I can’t believe it is Christmas in a matter of weeks. For this years Winter nail polishes I seem to have stuck with two colour themes and despite loving and using these a lot, for some reason I haven’t blogged about them yet. Unlike my Autumn favourites, there isn’t a particular brand I’ve been loving, instead it’s more the colours. I’ll be updating with links as and when I post a NOTD so if you’re interested in how a particular polish looks then keep checking back. How could I write about my current favourite nail polishes without talking about Avon Licorice. If you’ve been following my NOTD’s over the past month or two then you’ll notice that I’ve been using this as a base for all my glitter nail polishes. Although I do own other black polishes this one from Avon is my favourite. It’s opaque in one coat and is incredibly glossy. It’s been a while since I’ve finished a full size nail polish but I’ve had to decant the last few drops of this one into a mini bottle so I’m able to use it all. Rainbow and Pearl Effect are pretty similar in finish but I just had to include them both as they’re completely different colours. Rainbow was hugely popular when I started blogging and I managed to grab a bottle in a blog sale after not being able to find it in a Superdrug. Since then I’ve managed to find quite a few dupes for it but it’s still my favourite out of them all. You can sort of see what the polish looks like but pair it with a black and it looks amazing. All the different colours remind me of when you see petrol on wet floor. Pearl Effect is similar but instead of all the different colours, it’s just an electric shade of blue. Elle’s Spell is also packed full of flakies (notice a trend here?!) but instead of a clear base it’s red which is quite unusual. This can be worn on it’s own or layered over a red base but I prefer black as it seems to make the colours even brighter and more vibrant. I’ve had the Rococo Gold Leaf polish for a couple of years now and I hate to say it given the price tag but I’ve only used it once or twice since I got it for Christmas. Also since I bought it it’s increased in price by £10 which is just crazy. I thought £25 was a lot but I don’t think I would have bought or asked for it had it originally been £35, it’s just not worth it. I think the main reason I haven’t used it is that it’s quite hard to apply it evenly and for it to look good and not a mess. I’m going to make an effort this winter and Christmas to actually use it and try a few different colour ways. I’m thinking black first and then robin egg blue. With it being Christmas and all I couldn’t not add in a red but I prefer this slightly pink-red from OPI, Meep Meep Meep. It’s also packed full of tiny gold flakie shimmer which makes it a bit more interesting. Finally is Barry M Mustard*. Although this is really an autumnal shade, it’s one I’d wear all year round. 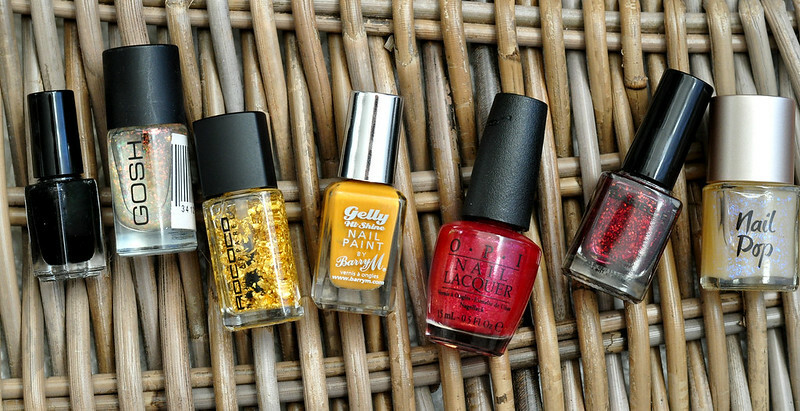 The yellow polishes are so stunning!